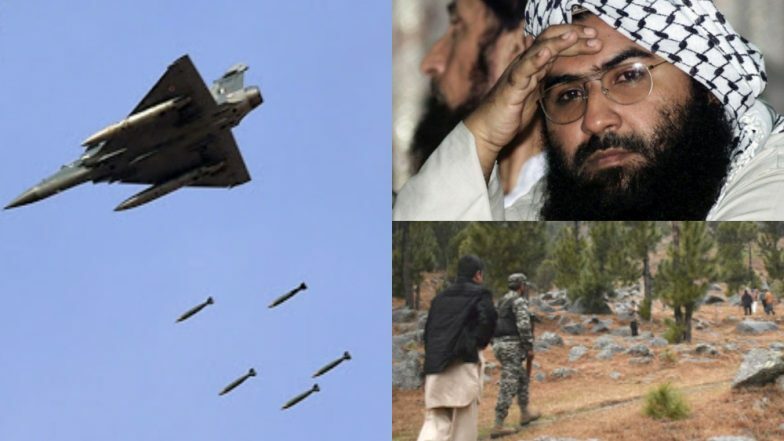 New Delhi, March 3: Contradicting Pakistan’s Foreign Minister Shah Mahmood Qureshi, Jaish-e-Mohammad chief Masood Azhar’s younger brother Maulana Ammar on Saturday confirmed that Indian Air Force’s Mirage 2000 fighter jets did hit the training camps at Balakot in Pakistan's restive Khyber Pakhtunkhwa province, about 80-km from the Line of Control (LoC) early on Tuesday. He also slammed Pakistan Prime Minister Imran Khan for releasing IAF Wing Commander Abhinandan Varthaman. In an audio message, Masood Azhar's brother can be heard saying that Indian fighter planes didn't bomb ISI or Pakistan army, but its centre in Balakot. The message was first played – two days after the air strike at Balakot – as an address to militants at the Madrassah Sanan bin Salma in Peshawar. The official has confirmed the reports by a Pakistani journalist who lives in France and had tweeted about this. Even his identity has been verified, reports the Hindustan Times. IAF Mirage 2000 Jets Destroyed 4 Buildings of JeM Camps in Balakot, Confirms Radar Imagery. Commenting on the audio, a senior official stated that this is a ‘clear confirmation of the effectiveness of the airstrikes’. The official said, “The tone and tenor of the message also indicate that the strikes have hit the group hard forcing a senior functionary to issue a message to their cadre.” Balakot Strike Evidence Shared With Govt, Upto Them to Reveal: IAF. Earlier, Pakistan Foreign Minister had denied any casualties or damage of property by the IAF strikes in Balakot. Pakistani Army even took international media to the spot to show the site, which was allegedly cleaned after the IAF strike. With reports pouring in of Masood Azhar suffering from renal (kidney) failure and undergoing dialysis, Pakistan EAM Qureshi had said that Jaish had denied the responsibility of the Pulwama attack on February 14, in which 40 CRPF personnel were killed. He also stated he had asked Jaish about this and they have denied the reports. F-16 Was Used By Pakistan, IAF Displays AMRAAM Missile Part As Proof; All About The Evidence Presented by India (See Photos And Video). The remarks by the Pakistan EAM comes days after Imran Khan assured Indian – twice in his national address – that he would investigate the matter and act against Jaish, provided India gives actionable intelligence reports. India, in the meantime, had handed over a dossier with evidence of Jaish’s operations and involvement.